NO OTHER: Press & Publicity for companies that go one step further: Giorgio Tuma, The Guardian "New Band Of The Day"
The lineup: Giorgio Tuma (vocals, instruments), Alice Rossi (vocals), Alessio Borgia (drums, percussion), Simona Colomba (Farfisa, Wurlitzer, piano), Matilde de Rubertis (voice, guitar), Massimiliano Giannuzzi (bass), Salvatore Papa (guitar), Marco Tuma (flute). The background: We tend to think of cratedigging as a pastime enjoyed by hip-hoppers and soulboys, but there's another kind of cratedigger: the polymorphously intrigued, omnivorous record collector who, having exhausted rock for source material, looks elsewhere for new ideas, to that nexus of strangely compatible influences that includes Bacharach and David's songs for swinging marrieds, cocktail/lounge muzak, MOR, jazz, light classical, Italian and French movie soundtracks, 60s baroque pop, Brazilian tropicália, and the breezy harmonies of Fifth Dimension, Free Design et al. There was a brief attempt to hipify the naff in the mid-80s by Mike Alway and his él label, then in the 90s there was a spate of record-collectors-turned musicians: Jarvis Cocker was one, although it didn't reflect much in Pulp's music. Bob Stanley and Pete Wiggs, on the other hand, were two such Men From U.N.C.O.O.L. types, and you could very much detect the influence of all this in Saint Etienne's budget disco exotica, and the same goes for the boys and girls from Stereolab, and Sean O'Hagan of High Llamas. 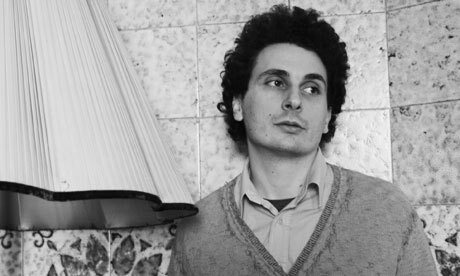 Giorgio Tuma, an Italian boy whose first love was the Clash, admits he had his head turned by Stereolab as a teen, after which he worked backwards: to Stan Getz and Astrud Gilberto, Antônio Carlos Jobim and Os Mutantes – he's even named his backing band Os Tumantes, in tribute to the tropicália legends. Tuma is signed to Elefant, a Madrid label that has Mike Alway's influence all over it, and he has out an album, In the Morning We'll Meet, which in its own airy, lightly-orchestrated way, is a quiet classic – if you like this sort of mellow madness. Be warned: some of it is so seraphic and sweet it makes the Swingle Singers sound like the Stooges. It's a kind of blue, but it's not the blues. So if you're drawn to that parallel version of the 60s that espoused elegance and innocence and eschewed the messier aspects of the counterculture, then you'll love what Tuma and his Tumantes do here. The truth: It's not hard to love something this soft. Most likely to: Take you up, up and away. Least likely to: Sing about downers. What to buy: In the Morning We'll Meet is available now on Elefant. File next to: Stereolab, High Llamas, Free Design, Burt Bacharach.